RIB Directory: A-to-Z Guide with a light load or fully loaded to its 4,120-lb. weight capacity. Its broad cargo deck provides room for two stretchers or cargo pallets. The effect of the Cat hull plus tubes creates a stable work platform when at rest. Equator series of boats. Novurania has introduced its new Equator 500 — measuring just 16 ft. (4.8 m) in length overall. Touted as the smallest in the line, which includes the Equator 530. 600. 660. 720 and 800. the 500 boasts an inboard 120-hp turbo diesel engine and stern drive — along with a seating arrangement for seven passengers. Circle 259 on Reader Service Card tank and integrated swim platform. Modulus hull design; all hand-laid, non- cored all laminate fiberglass hulls for use in extreme weather. 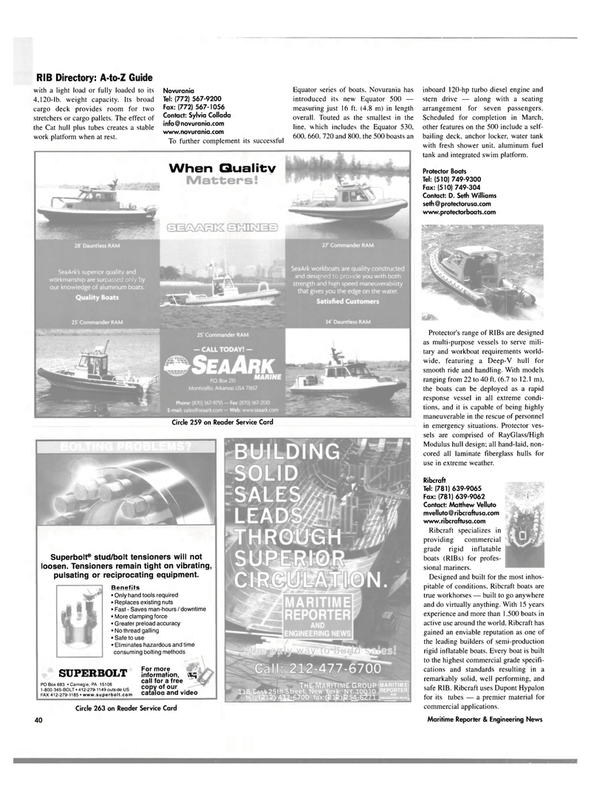 Ribcraft specializes in providing commercial grade rigid inflatable boats (RIBs) for profes- sional mariners. Designed and built for the most inhos- pitable of conditions. Ribcraft boats are true workhorses — built to go anywhere and do virtually anything. With 15 years experience and more than 1.500 boats in active use around the world. Ribcraft has gained an enviable reputation as one of the leading builders of semi-production rigid inflatable boats. Every boat is built to the highest commercial grade specifi- cations and standards resulting in a remarkably solid, well performing, and safe RIB. Ribcraft uses Dupont Hypalon for its tubes — a premier material for commercial applications. Superbolt® stud/bolt tensioners will not loosen. Tensioners remain tight on vibrating, pulsating or reciprocating equipment.